I’ve been dealing with a back problem for over 10 years. Since the injury, my life has been a series of active periods and recovery periods. That’s the way it is with most active people. Some people are young and lucky (I was that person once too) and they can go full-out, all of the time, with no pain or in spite of the pain. Most are not so lucky though. Being active is a mindset – a lifestyle choice. Every active person knows they will not be operating at 100% all of the time. Active people know there will be injuries and there will be setbacks. They do it anyway. Some say that a person’s pet is a reflection of themselves – that the attitude of the owner determines how their pet lives. That is definitely true for Chester and Gretel. Since they can’t speak for themselves, and probably don’t think too far beyond the next meal, it’s up to me to make choices for them, advocate for them, and protect them. As most of you know by now, Gretel injured her back a couple of months ago. I chose to go with modern science and take a proactive approach to her recovery. You can read more about the science behind my decision HERE. For a long time, strict crate rest – keeping a dog largely immobile – for 6-8 weeks has been the “best”, and most recommended, treatment for back injuries for a long time. That’s changing though. Veterinarians are discovering that crate rest WITH active rehabilitation speeds and improves recovery. The goal nowadays is to get a dog up and moving as soon as they can to help make them stronger and reduce the chance of re-injury. Yes, every dog is different and you should go with what your vet tells you. However, rehab vets are seeing dogs who underwent back surgery walking within a couple of weeks using this active recovery method. Gretel recently had her 11-week post injury checkup. Her rehab vet was super impressed at how well she was doing. The circumference of her thigh muscles had increased by 1 cm, indicating that she was becoming stronger. Even better was that the circumference of both thighs was the same, indicating that she was getting stronger in a balanced way. Developing symmetry and balance in muscle strength is extremely important so the muscles don’t pull things out of whack. Gretel got the go-ahead to progress the difficulty of her rehab exercises and free rein to continue our hike training. I’ve been taking Gretel to a dog rehab gym once a week to help her learn how to do the rehab exercises and teach me to better communicate with her better. She was doing great there. She was so smart and picking up on everything she was being asked to do. She was working so hard to do the exercises. [youtube https://www.youtube.com/watch?v=Kr6gkkEtMDE]It was my fault it happened. I had signed up for a 45-minute session but didn’t say anything when the trainer ran over time. Gretel was doing so well that we increased the difficulty on an exercise she had already been doing. We also tried a couple of new ones. There were no signs that she was getting sore or tired. As soon as walked out the door, something was strange. I tried to walk her across the parking lot to go potty and she was very hesitant. I thought that was weird but not alarming. However, by the time we got home, it was clear she was in pain. She was squinting a little and she was making small, quiet grunts when I picked her up. I did the test where you fold over their toes and she seemed to be righting her feet ok but I was still concerned she was having a problem with another disc. A couple of phone calls later, we were back in the doggy ER. The vet couldn’t find any pain points in her spine and there was still no delay in righting her feet. They sent us home with more Tramadol for pain and the ant-inflammatory Meatcam. I feared that we would have to start the crate rest and rehab all over again but they said that she was probably just sore from the workout. I was told to decrease her activity for 10 days. I asked if I should put her on crate again and they stressed that it was only necessary to back off on the hiking and rehab exercises. I think they didn’t want me to keep her in the crate because it might undo some of the progress we had made in her strength. So, here we are. My eye is still on the goal of keeping Gretel active but we’ve had to take it back a notch for almost two weeks. Now we can cautiously start where we left off. It’s just a blip in her journey to recovery. I’ve always known this was a possibility and was mentally prepared. 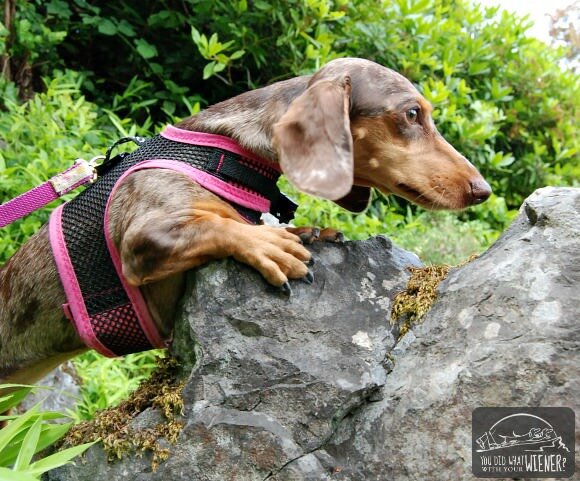 I know Gretel has Intervertebral Disc Disease (IVDD) – the spinal disease common in Dachshunds. I know that she will be dealing with pretty much the same situation as I am with my bad back. There will be periods in her life where she can be active with no problems. There will also be periods where she will have flare-ups and setbacks. There will be times when she needs to reduce, sometimes significantly, her activity level to recover. This won’t be our last setback. In fact, I am well aware that she could rupture another disk. Next time we might not be so lucky and she could have some paralysis and need surgery. Thank goodness I have pet health insurance that will cover that if we need it. I’m not using these survey results to say it’s guaranteed that more active dogs suffer less IVDD episodes. There are a lot of other factors that play into whether an IVVD dog will have an episode or not (one of the biggest being whether a dog is overweight or not. Click here to see how you can tell if a dog is overweight). However, Gretel’s super-smart and experienced rehab vet feels very sure that an active dog with stronger muscles is less likely to suffer re-injury from IVDD. As an active person myself who does way better with pain and injury when I am strong and in shape, that makes logical sense to me. So off we go on our trail adventures again. Strangely, as a lot of things along this IVDD journey have been, was a positive. Now I know what a setback from being over-worked looks like. I feel more confident that I’ll know what to do if it happens again. Thanks. Yeah, I know she could go hike 7 miles tomorrow if I let her but she shouldn’t. I keep our walks intentionally shorter than I think she can handle. It’s actually good for me too because I have a tendency to push myself too far and regret it later too. Dang, poor girl. It will be an ongoing management thing, just like with your back. Better than sitting on the couch though. Give her a hug from me. Thanks for posting this. We are about 2 weeks out from our 2nd episode. We have decided to go the conservative route mostly due to the expense of surgery. Pain meds , prednolisone and restrictions are working so far. I cannot stress restrictions enough. Yeah, it’s very important to rest your pup as long as the vet says you should. Many people cut that short because their pup seems to be feeling better but that can make them more prone to re-injury. Gretel was given a controlled, active rehab program but I was committed to keeping her in the crate the entire 8 weeks when she wasn’t doing approved movements. I hope the second recovery goes well for you guys. Poor Gretel! It is so easy to overdo things when they are having so much success. I wouldn’t have hesitated to keep going if I noticed we were getting a little extra time with the physical therapist, either. Hope Gretel’s back to being active again soon! Life is meant to be lived but it’s best when we understand our personal needs and have realistic expectations. Stay strong my little furiend Gretel! Oh my goodness, I’m so glad that it wasn’t a major setback! It’s great that you’re getting Gretel up and moving to keep her strong, and she seems to luckily be dong great. I used to obsess over the idea that my extremely active and very fit dox might have a back event. Suddenly finding myself with our other ancient dox, whom we had recently adopted, in a hospital filled with back surgeons and different kinds of therapists actually calmed my long held fears. One thing I would say to dox owners is to know right now where you would go in case of a back event. Time is of the essence, esp. if surgery is needed. Our dox takes two meds that resolved his issue and I’m grateful for every day that our little old guy is still scampering around; every day that he’s on his feet is gravy, as my dad would say. Best wishes to Gretel for a long happy life. Thanks. And great tip. I, too, have heard that time is of the essence if a dog has an episode. I’m so glad that meds resolved your pup’s issue. My mini dash Pip., blew his back out, surgery, disk repair, no movement six full months. Then he’s back one day doing his exercises he pulls a leg back, two weeks later like nothing ever happened. Did the preventive surgery to prevent further blow outs of the disk. He has good days and bad, but he knows his limits, when we are out walking, playing fetch, when he starts to feel the pain, he comes over and stands on my foot. The sign to pick me up, and backpack me back home. Please share with me the pet insurance you have. I have two doxies, both have had surgery, and I have not found any pet insurance that will cover potential disc problems. Thanks, and your little Gretel is so cute! Hi Sheryl. We have Trupanion. They are one of the only pet insurance providers that will cover congenital diseases – so back issues in Dachshunds caused by IVDD are covered. Unfortunately, NO insurance will cover pre-existing conditions. That means that it won’t be possible to get insurance for your two Doxies that will cover any future back problems. If you have a Dachshund that hasn’t had any issues yet, then it might be good idea to get it. For your two that had surgery, I suggest putting some money away monthly to help offset any future costs. I pay around $80 a month for both dogs with a moderate deductible. Putting the same amount away in savings might be a lifesaver if they ever need surgery again. Good luck! My dog (a beagle/hound mix) is currently in the hospital recuperating from surgery for IVDD. He was in a lot of pain and he is typically a very active dog (we hike 3-4 miles per day). I didn’t think twice when the neurologist recommended immediate surgery. He will be coming home tomorrow and on strict rest for up to a month. This is the part that concerns me, so reading your posts with tips and tricks for crate rest are so much appreciated! I just purchased a larger crate that can accommodate his bed and food bowls and give him some room to stand up and turn around, but I plan on following the post-op rest period very carefully. I never want to see my dog in that kind of pain again! I hope your pup’s recovery went well. My dog Dash and I are active hikers like you and Gretel. Dash is used to doing about 5miles at least three times a week. 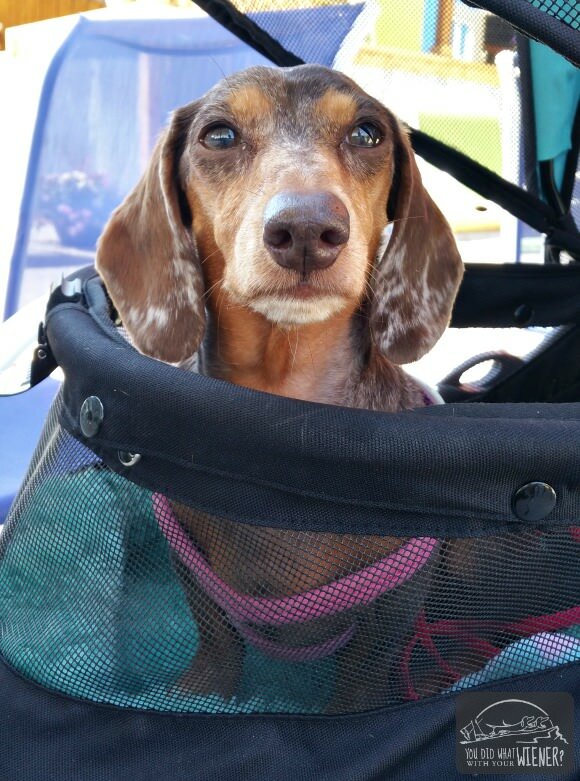 Last month she suffered from IVDD at three and half years old. Recovery has been tough as hard to keep us both in the rest period. She recovered well and we got the ok now 6weeks post-op to go on short walks 20 mins. It’s been two days of short walks but I get nervous when after she gets a bit wobbly till we’re home and goes crazy with toys. I just looking for insight how did you increase mileage and activity level to get back to hiking mountain status? My IVDD dachshund just had his first flair up yesterday since his initial incident about 8 months ago. He’s three and when he first hurt himself we were walking three miles basically every day. I’ve massively dialed things back since his six weeks of crate rest, and this was good to hear while contemplating his recovery period from this flair up. It gives me hope. I’ve been torn between the advice of my vet (2 week’s crate rest this time) and the IVDD community telling me that it should be six weeks even with cold laser therapy. It sounds like you recommend maybe checking out a canine rehab place for after his crate rest? If it were me, I would definitely go closer to the 6 weeks of crate rest for the flair up. I find that most veterinarians (as reported by readers) way under-recommend the proper length of crate rest. If you can afford it, I definitely do suggest talking to a rehab vet. You could even do that after the two weeks. The rehab vet can reassess him and give you a plan to rehabilitate him during the remaining weeks he is on crate rest (My Gretel was allowed very short walks in a controlled (safe) environment and some “doggy gym” exercises to strengthen her core). Good luck to you guys!